When I have the time, I make sour cream, yoghurt and fresh yoghurt cheese which is a delicious spread, particularly on rye bread. 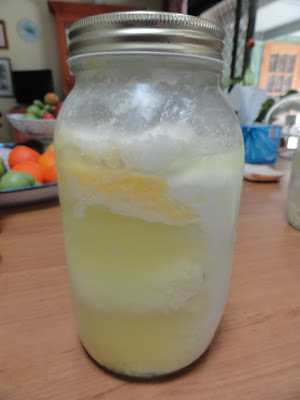 I know many of you make your own yoghurt and I have written about it in the past so today let's talk about whey - the byproduct of yoghurt and cheese making in all its various forms. This is my latest batch of yoghurt, made overnight using yoghurt from a previous batch. You can see the whey has separated from the milk solids when the jar lay on its side all night. Whey ready to use for baking or for lacto-fermentation. Whey is sometimes seen as a waste product by some cheese makers, or it is given to calves or pigs to drink but it's a healthy live liquid that can be added to many recipes and used as a milk substitute. Whey keeps for a long time in the fridge. I have used it after it's been stored in the fridge here for nine weeks and it was fine. 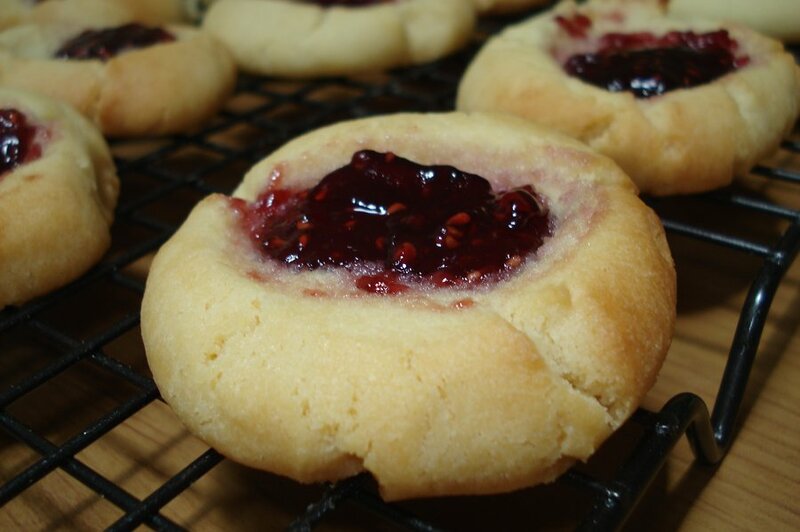 I use whey in baking, simply by substituting the milk portion of the recipe. Every cake or scone recipe I've given you here, you could substitute whey in place of the liquid recommended. (Above and below) Some of that yoghurt was made into a spicy chilli jam cheese. You can use whey in other recipes as well. Sauerkraut, for instance, is delicious made with whey. The process is called lacto-fermentation. Lacto-fermentation was used in earlier times to preserve vegetables for long periods of time when there were no fridges or freezers. Vegetables treated in this way have increased levels of vitamins and enzymes and the lactic acid in the fermented food promotes the growth of healthy flora in the gut, in the same way natural yoghurt does. 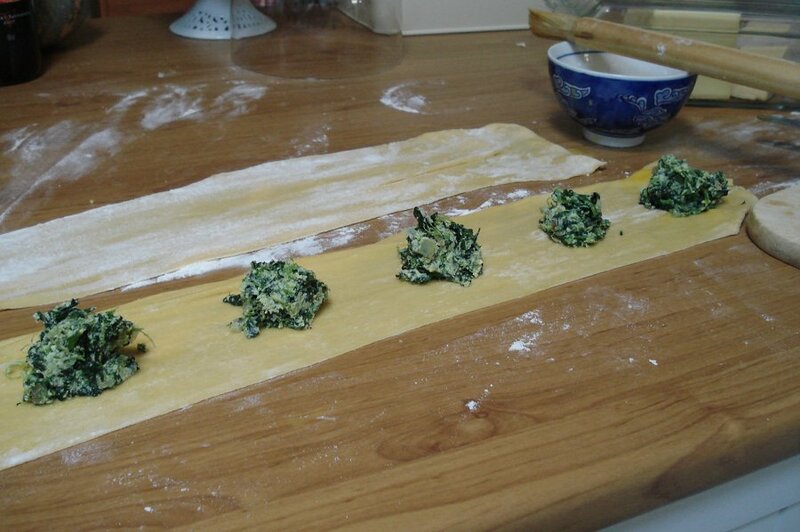 Here are some very good recipes, using this simple process, from Nourishing Traditions. Even if you've never tried this kind of food before, give it a go. 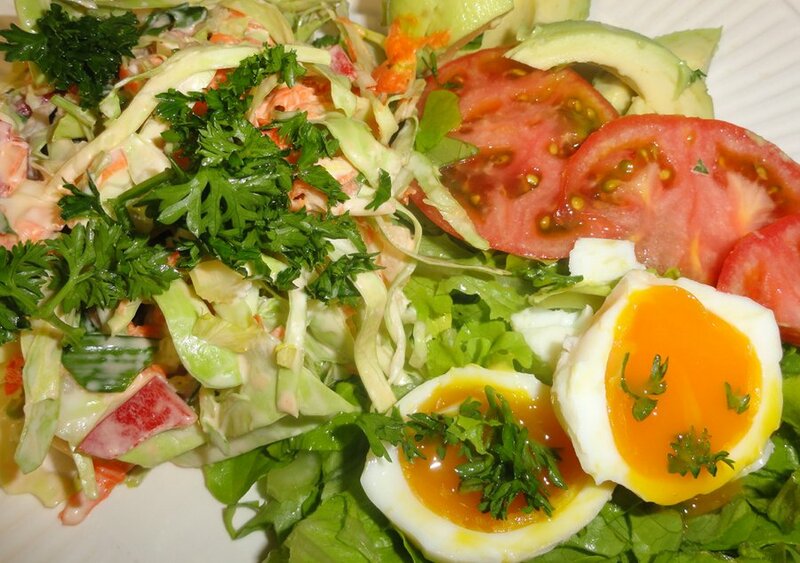 It's delicious, healthy and really easy to make. In a bowl, mix the cabbage with the caraway seeds, sea salt and whey. Pound it all together with the end of a rolling pin or a wooden meat mallet for about 10 minutes. You want to release the juices from the cabbage. Place this into a litre/quart size preserving/canning jar and press down very firmly until the juices come to the top of the cabbage. Make sure the top of the cabbage is one inch down from the top of the jar. Put the lid on and secure tightly and sit it on the bench for three days to ferment, then put it in the fridge. You can eat it then but it will get better the longer it's left to mature. Place all the ingredients in a large bowl and pound to release the vegetable juices. Then refer to the instructions above as it's the same technique. Leave it for three days on the bench to ferment, then store in the fridge. It will get better with age. 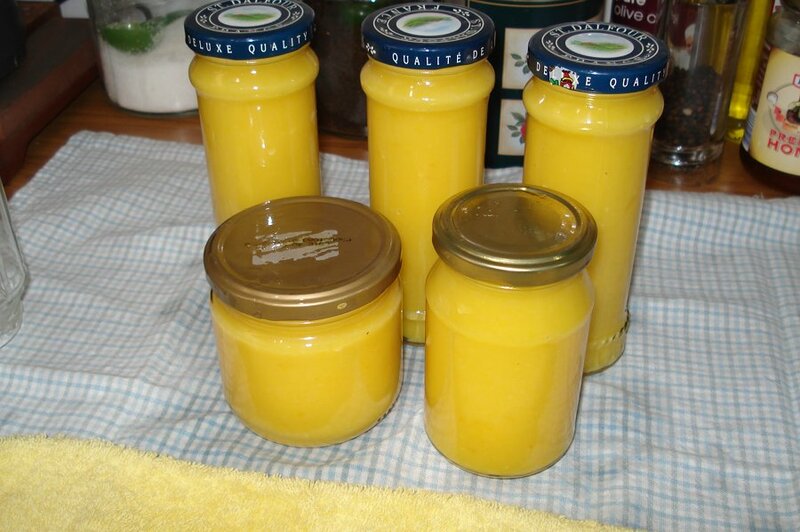 Mix all ingredients in a bowl and place in a litre/quart preserving/canning jar. Press it all down in to the jar and if the vegetables aren't completely covered, add a bit more water. The top of the vegetables must be one inch below the top of the jar. Put the lid on, leave on the bench for two days to ferment, then store in the fridge. Okay everyone, hold on to your hats, the Great Nappy Hunt starts tomorrow! The Hunt is an online scavenger hunt across 150+ work-at-home parents' websites. My lovely friend Rebecca from Bean Sprout Bubba sent me some information about The Hunt and it's looks really exciting, with $10,000 worth of prizes to be won. Rebecca is sponsoring two prizes and I have to tell you that I bought two of the chrome nappy sprayers she has on offer, and they're brilliant. Rebecca has a special offer throughout September for registered Hunters. You have to register to take part and when you register, a Hunt discount code will be emailed to you. Registration is free. You can find more information on Rebecca's website: Bean Sprouts Bubba. Good luck, Hunters! 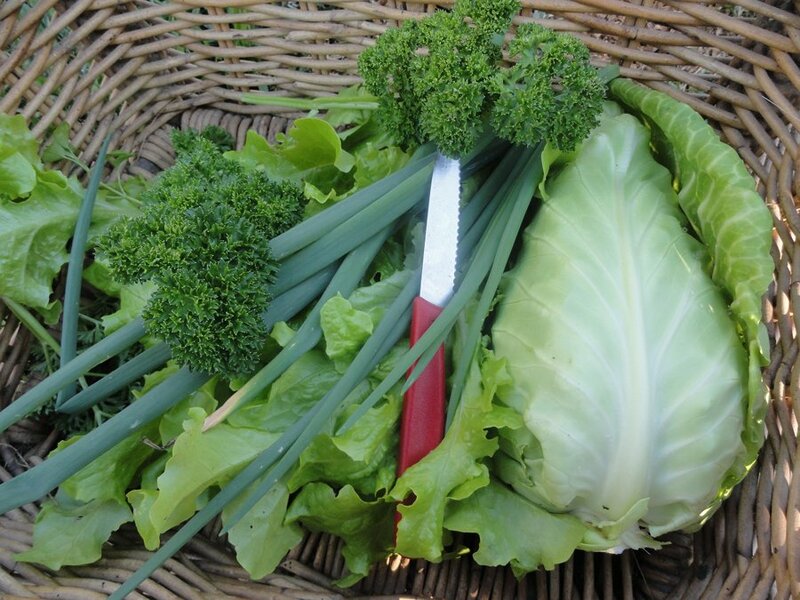 With food prices still very unstable and some fruit out of our price range, we have made a commitment to keep our kitchen garden in full production for as long as possible, and to add to our fruit garden. Usually the thing that gets us in the end is the hot weather, the bugs and the humidity, which generally hits around mid-November. This year we'll have herbs in pots, lettuces in troughs, and different varieties of tomatoes to help keep a supply of them up, especially over Christmas. One of the difficulties of kitchen gardening is that you have to plan so far ahead. Hopefully our planning gets us through the price rises as well as vegetable and fruit shortages. This kale plant is 5 feet tall. 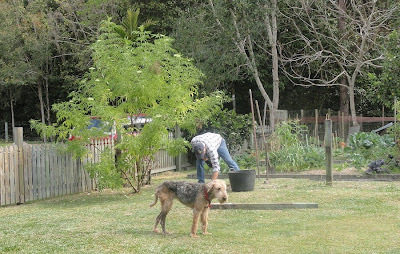 We went to our local farmers market on Sunday to pick up some seedlings and look at fruit trees and herbs. I had my camera ready to take you along for the ride, but when we arrived, just as dawn was breaking, I got my camera out and realised I'd left the battery at home in the charger. Ahem. There weren't a lot of people around because it had been raining overnight but it looked to be a fine day ahead and everything was fresh and cool. We came home with borage, thyme, heirloom tomatoes - Siberian and Kaziki (I think), dwarf green beans, ruby chard, beetroot, bok choy, lettuce and a grafted Reed avocado. I love the Reeds, for me, they're the best tasting avocado. A friend of ours has one in her backyard, so we have them most years, but this was the first time I'd seen the grafted trees for sale. It will go into our new fruit orchard. 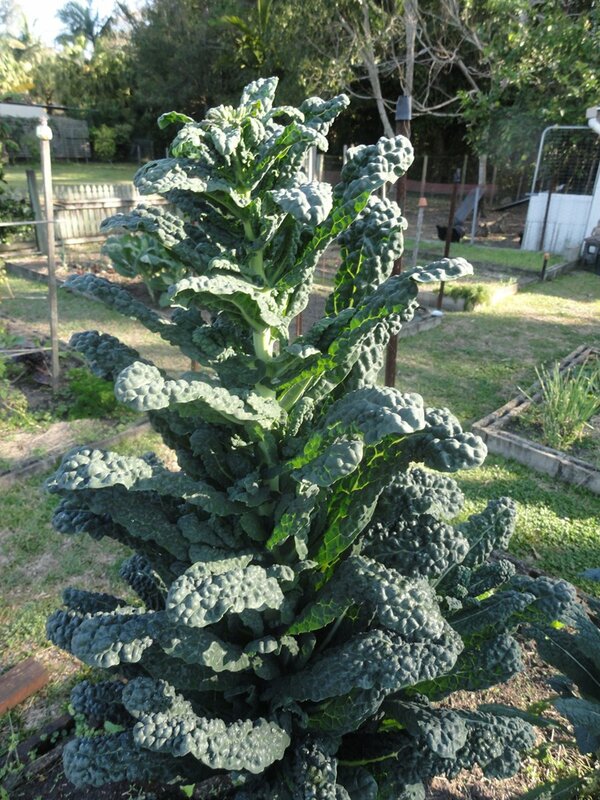 Usually we grow food in our backyard for the sheer pleasure of it. It gives us organic produce that is fresher than anything we can buy and we know it's been fertilised with organic fertilisers and watered with rain water. We grow only what we eat and love and if we have an abundance of anything, we preserve it in the freezer for later. And now there is the added bonus of it saving us some money. 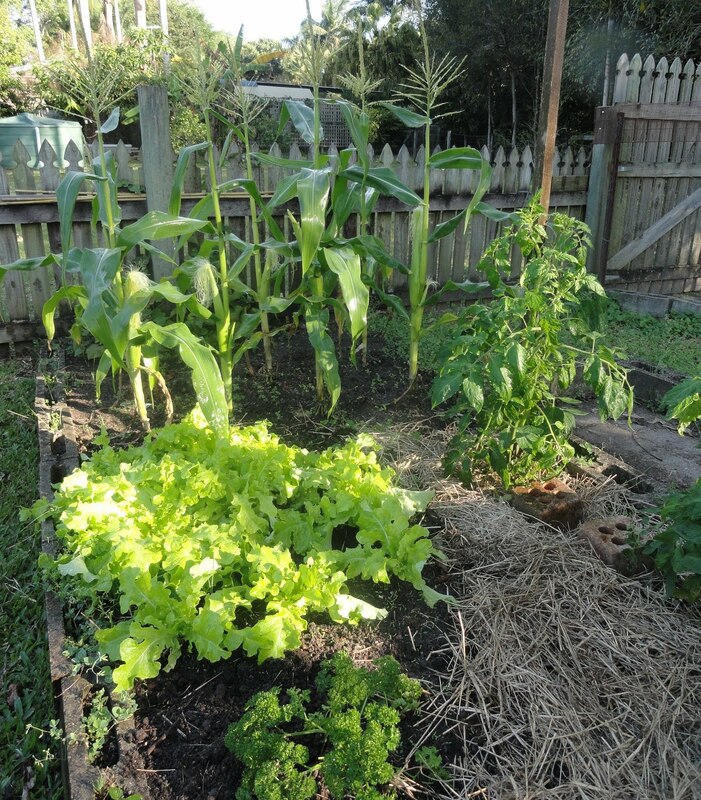 Learning how to grow your own vegetables really will give you a head start in your simple life - it's such a positive eco-friendly and frugal activity. I believe it makes us much more independent too - we don't rely on primary producers or shop owners to stock what we like, so if we don't have delicious heirloom tomatoes, crisp lettuce, fresh herbs and organic celery to eat, it's our own fault, no one else's. That's quite an incentive to keep gardening. 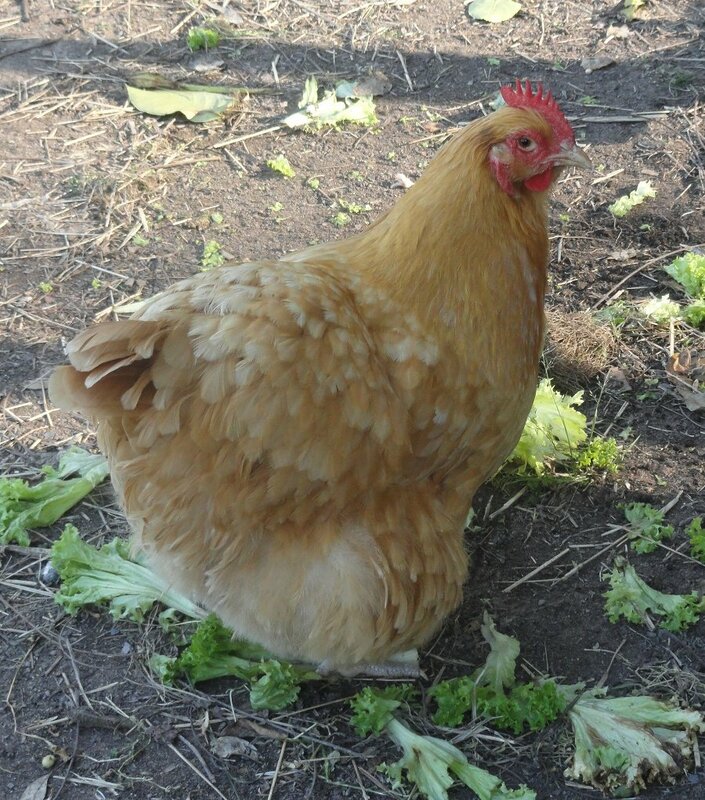 The lovely Martha, our buff Orpington. There is nothing quite like going into the garden in the late afternoon and looking through the beds to see what is ready to pick. Bringing those pickings inside, in a basket laden with vitamins and minerals in the form or ruby red tomatoes, bright green lettuce, blood beets, and crisp beans, gives me a feeling of empowerment that makes me want to keep sowing seeds, looking after seedlings and collecting rain water. 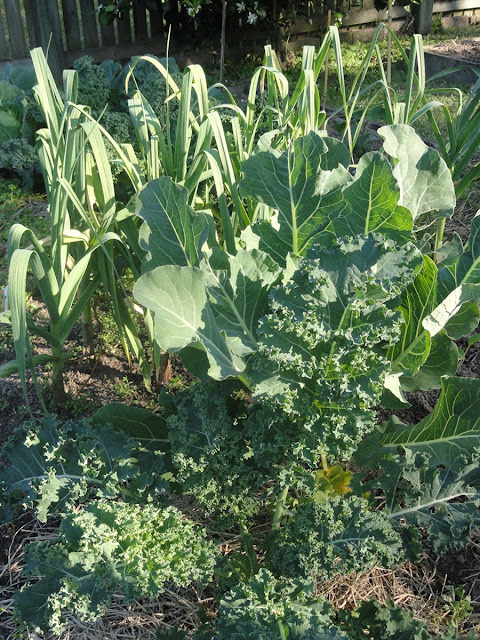 There is such a great payout for the effort you put into a productive garden; it's hard to beat. I would like to be able to tell you that work in a kitchen garden is always wonderful and rewarding but that is not true. Sometimes there are unexplained failures, bug attacks, and storms that rip the heart out of the garden (and you), but there are rewards, many of them, and they far outweigh the problems. When I pick a salad and have it on the table 30 minutes later, I know it's teeming with nutrients that would have leeched out of shop vegetables. 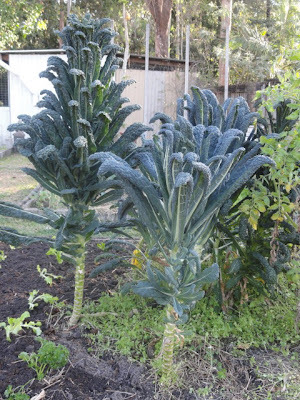 When Hanno digs potatoes and picks cauliflowers, cabbage or kale to have with a warm winter casserole, made with locally grown meat, I know that the energy and time we put into our garden pays us back ten fold. I walk into our garden at this time of year and I am amazed by the new life around me. When I think that kilograms of tomatoes will come from one tiny seed buried in soil and watered, then I know that anything is possible. And when we can fill our dinner plates with wholesome food - salad, herbs and boiled eggs a few hours old, and do it consistently, then I think that maybe we can do anything. That's why gardening keeps people coming back season after season - the possibilities are endless and they're there for the taking. We had a bit of excitement here last week, I was interviewed for Women's Weekly magazine. They wanted photos to go with the interview so they sent along photographer Russell Shakespeare and hair and makeup stylist Tania Travers. To tell you the truth, I was dreading the photo shoot but Russell and Tania were such lovely people, I ended up enjoying it. Even though I had to hold onto a chicken for 20 minutes. Russell setting up the equipment in the kitchen. We got the chicken photos - with Lulubelle and Martha, as well as some other photos in the garden and inside the house. We only had a couple of days notice they were coming, and those were the days I was at the Neighbourhood Centre, so instead of having a big cleanup, they saw the house and garden as it usually is - a real working home that is productive and well and truly used. 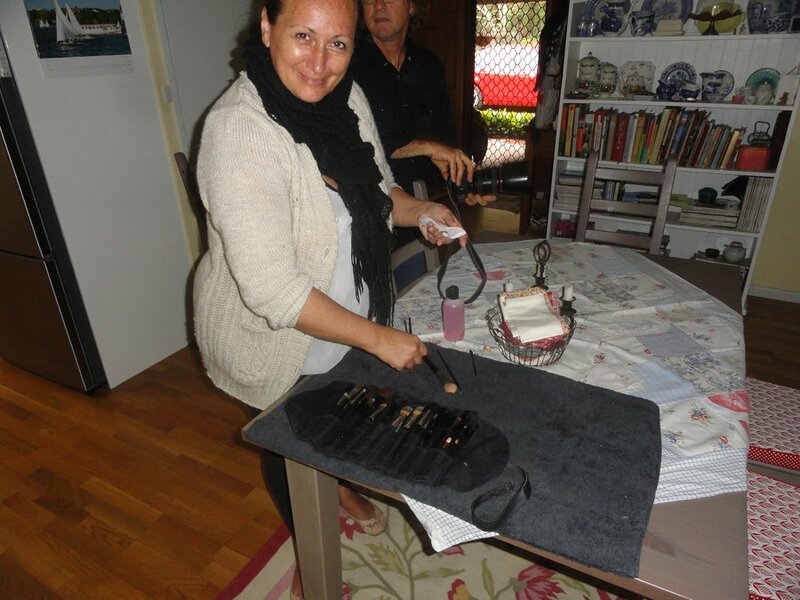 The lovely Tania folding up her makeup kit. For those readers who live in other countries, the Women's Weekly is an iconic Australian magazine, established in the 1930s, and is the best selling magazine in Australia. It features news about women, with articles about craft, cooking, family, home and fashion. I grew up with my mother and grandmother reading the Weekly. It was a weekly publication then and you could always find the current copy in our home, and in the homes of all my friends. It was part of growing up in Australia; still is, I guess. It's exciting to see the magazine reaching out to other media, like blogs. Hopefully it will provide a link to people who may never have heard about simple living, or if they have, know little about it. I have written quite a bit recently about how I believe change is happening, this is part of it. The idea of cutting back, slowing down and making productive homes is slowly seeping into the mainstream; this will probably give it a boost. And if the Women's Weekly readers use the link to this blog, not only will they read about Hanno and me, they'll find you too. They'll find the women-friendly world of blogs and that has to be a good thing, for us and them. Amanda Brooke has a beautiful blog where she writes about her simple life and being a mum. Amanda has just opened a shop called Little Eco, full of natural and eco-friendly goodies for babies and children. She is having a giveaway to celebrate the shop opening, you can find the giveaway here, but also go to Little Eco for a look and then get yourself a cup of good tea, and read some of her current and past posts here. With winter's end coming soon and the forecast tomorrow for heavy rain, I'm thinking of making another thick vegetable and barley soup, like the one (above) I made a couple of weeks ago. This uses fresh vegetables from the garden, grains from the stockpile and soup bones and a little meat from the freezer. It's a complete frugal meal that will last us for quite a few days, or it can be frozen for later. The photo above shows my latest experiment - sprouted soup mix. 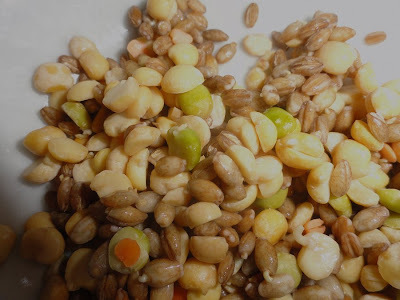 I want to make soup with sprouted grains but didn't know if the common mixture of grains and legumes in soup mix would sprout. They did! You can see above the barley has sprouted, so have the split peas. I'm not sure how it will end up in the pot, but at the moment I think I'll add some soup mix and cook as normal, then add the sprouted soup mix at the end. I don't want to cook the sprouts too much, they are quite soft and the added texture will be a great addition to the soup; we'll have test tastes and modify it as we go. When we have this soup, I'll write about it. ADDED LATER: Morag wrote to urge me to add a warning about using beans for this soup. Eating uncooked or undercooked beans, particularly red kidney beans, is dangerous and any form of bean mix should not be used for sprouting like this. Please read this. Thanks Morag. I have discovered a new (to me) form of knitting that I really like. Log cabin - it's like a patchwork log cabin pattern, only knitted. 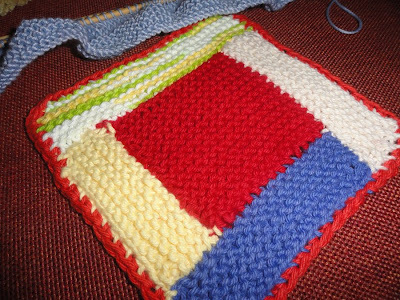 It looks to be a simple way to add colours to a dishcloth and it allows me to use up little bits of cotton and bamboo that by themselves would not make a full cloth. However, you can also make rugs/afghans using this pattern in the same way you build a rug using crocheted granny squares. I'd like a knitting bag made of log cabins too. This is my first log cabin dish cloth. It's a bit messy and I crocheted the edge, but I think it has a certain rustic charm. I'll certainly be knitting more lob cabins and may be joining some to together to make a larger project. Here is the Purl Bee's tutorial for log cabin knotting. The always incredible Mason Dixon women, Kay and Ann, wrote about it in one of their books and also here on their blog, where they show a beautiful knee rug (scroll down to the bottom of the page). 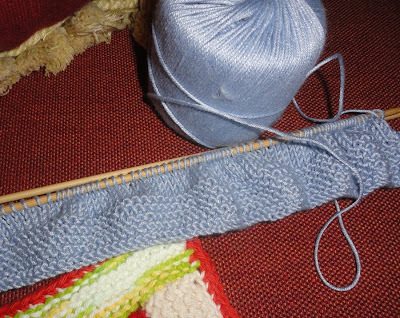 Here is a good You Tube tutorial about how to join your colours when knitting this pattern. And here is a whole neighbourhood of log cabins - they're really beautiful. My other knitting at the moment is a sky blue bamboo singlet\vest for Alexander using this pattern from The Thrifty Knitter. It's so soft and cuddly and beautiful to knit with. I'll be taking it with me today when I conduct my first Crafternoon at the neighbourhood centre. I hope hundreds of crafters holding great baskets full of sewing, knitting, crochet, patchwork and all sorts of different crafts turn up, but if they don't, I'll be happy with a handful of eager ladies or gents. 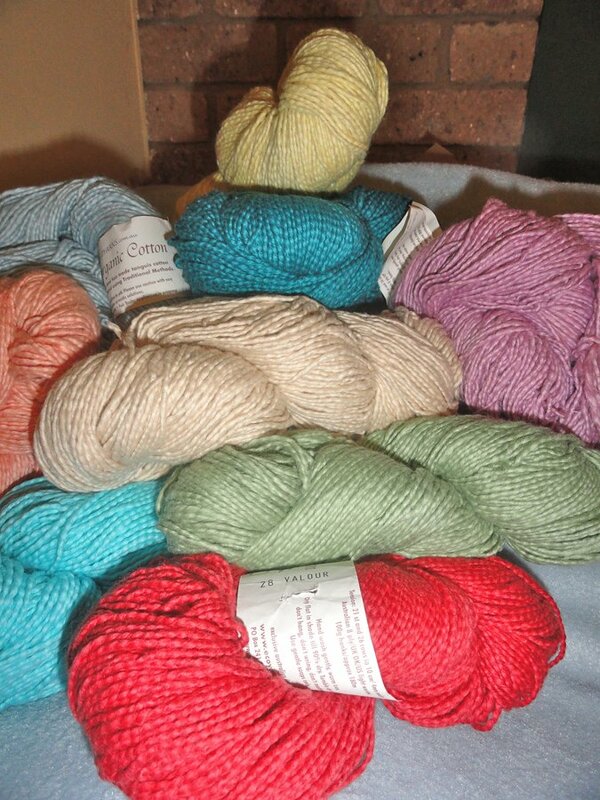 This is a new addition to my stash - a collection of naturally dyed organic cotton from Eco Yarns. Craft is such a wonderful way to bring people together. It can be a bridge between older and younger women who want to learn various needle crafts, it is the vehicle that transports the household crafts our great grandmas used to decorate their homes and clothe their families to us to use in a modern way, and it brings people together to teach and learn in a way few other activities can. I am looking forward to today - we start at 12.30pm, just after the shared lunch, and go till 2.30pm. Everyone is welcome to join us. In the most recent gardening post, Patricia asked about how Hanno and I work together and added: "Mainly I ask as quite a number of friends would like to retire but are not looking forward to spending full days with their partner. Therefore its very interesting to read how you balance this as there is a big adjustment all round when two people are retired together." Lemon butter ready for the cupboard. I don't remember having too many concerns about spending all my time with Hanno - maybe I was too focused on being at home and working here, or maybe it's because I always think I can do something about the problems I face. 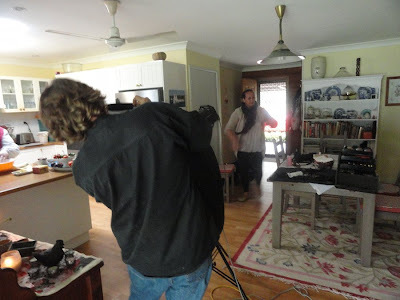 I gave up work first, then he did; we swapped paid work for unpaid work at home. We knew we'd have far less money but the work we did in our home would make up for some of that. We were excited - it was a challenge for us. At a time when most people slow down, we made the conscious decision to work more, to do for ourselves as many of the things we used to pay for and therefore cut our costs. Of course, we also slowed down and lived with less stress because we were our own bosses, we didn't have to go out into the world to earn a living everyday and we could choose to do our work in our own time. I think that if you give up work and don't replace it with anything, you're looking for trouble; you'd be arguing with everyone who crossed your path. I'm not saying that Hanno and I never argue, we do, but it's soon forgotten. And things go wrong here, it's not all smooth sailing but we know now that most problems are fixable and we don't stress too much about anything. I think our key is that we have mutual respect. I don't tell him what to do and he doesn't tell me. I think the most common question we ask each other is: "What will you be doing today?" It's not a competition anymore. I think when you're younger and raising children, working, paying off debt, trying to get ahead and generally trying to be two places at once, it can become a bit of a competition about who is doing the most work at home. When you retire, you have to give all that up, you have to commit to harmony in the home and work on becoming friends as well as husband and wife. You hear jokes about henpecked husbands, overbearing husbands, wives under the thumb and dominant wives and maybe those jokes bear some truth in some circumstances, but it doesn't have to be like that. Like anything important, you have to work at it. Putting two people together inside four walls can be your idea of hell but it can also be wonderful and enriching - two people working towards common goals. It helps if you can divide up the chores according to your strengths so that you fill your days with meaningful work, and by that I mean the work that helps your home run smoothly and makes you comfortable. When those important daily tasks are done, then you have time to do all the things you want to do. I think it has worked well for us because we both want it to. Give and take. And although we rely on each other for the vital elements of any marriage - love, respect, trust, honesty, commitment, fidelity and shared happiness, we don't rely on each other for everything. We have time away from each other too - Hanno went on a holiday to Germany for five weeks last year and it is important to me to have time alone almost every day. So even though living together in retirement isn't always easy, when you work at it, and give everything you expect in return, it is. So I guess it's a matter of how much you want that. If you're prepared to work towards a balanced relationship - a 50 - 50 cut, and when you don't get that sometimes, it's okay, I reckon you're on the right path. You have to work towards balance but be okay when the scale tips 70 - 30. It won't be balanced every day, some days it will be 60 - 40, some days 90 - 30, occasionally 100 - 0. You have to accept that as part of an faithful and steadfast relationship. Because in the long run, the scale will balance out, and that's what you're in it for - the long run. I don't remember doing any knitting for my own babies. I didn't sew for them either. My mum knitted beautiful booties and jackets for them, and I remember when I lived in Germany, just after Shane was born, mum used to send a couple of letters per week, and in each of them was a pair of booties. It seems like such a sweet and quiet thing to do and I doubt I appreciated it as much as I should have when she sent them, but I love the memory of it very much. My sons were both born in July, just 12 months apart. It was very busy in those early years. I started sewing for Shane and Kerry when I had more time. I guess they were around 5 and 6 by then and I made shorts, tops and marble bags; easy things like that. 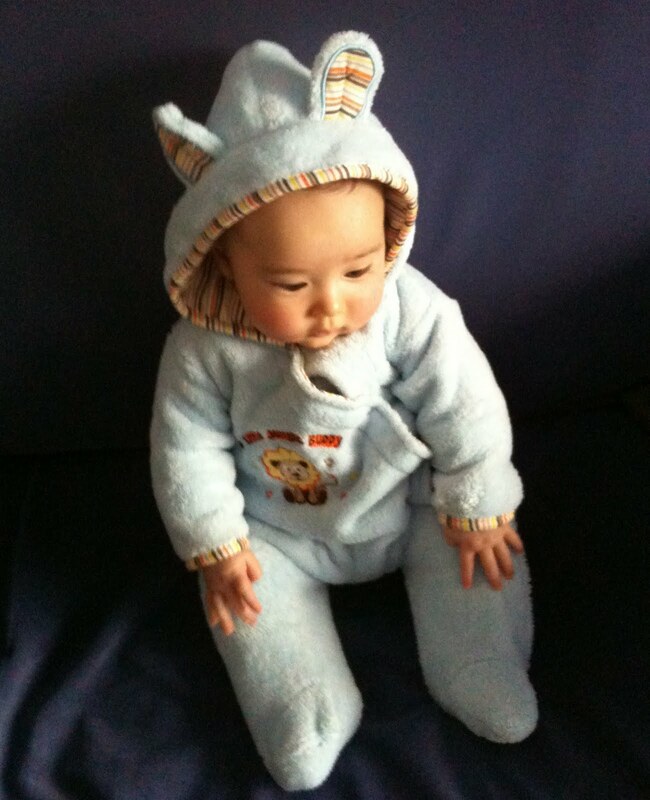 So it surprises me how compelled I feel now to sew and knit for my grandchildren - Jamie and Alexander. I am enjoying the planning of each project and when I went to Spotlight yesterday and found very good quality polar fleece for $2.50 a metre, then got 20 percent of that because it was a little bit dirty on the edge, I felt like I'd won the lottery. I scooped up those fabrics and took off out of there with a smile as wide as the Sydney Harbour Bridge. This is Jamie, he's almost six months old now. I hope to get more photos of Alexander when we visit next time. It's tough and a little bit sad to be too far away from our family to see them regularly. We try to get there every month and there have been visits here but still, I feel like we're not really close enough to be of help if we're needed. That is no one's fault, it's just how it is, so knitting and sewing lets me feel a little bit closer to all of them. I focus on how my project will look on them, or help in their care and that makes a difference. It's not as good as being there but it's better than not being involved at all and it makes our visits something really special. That is when we see not only how much the babies have grown but also how much their parents have grown into their new roles. I am one proud grandma and mother. 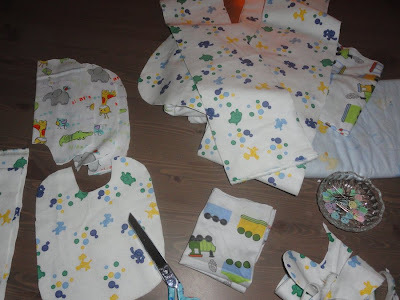 Both babies have a lot of clothes - mainly second-hand, or lovely organic garments, so there is really no need to make clothes. 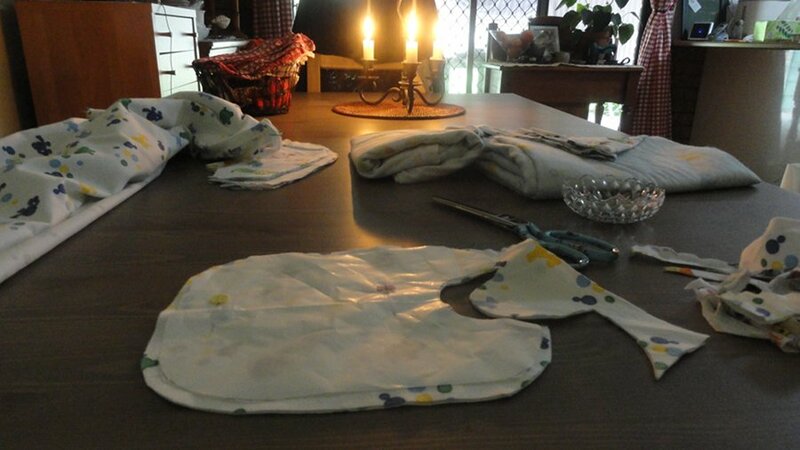 But all those little pieces, the wipes, fleece and wool covers, bibs and little hats, they're all mine to make. :- ) The babies will never remember how I sewed for them, and knitted little bits and pieces, but it's an important part of grandmothering for me and I'm enjoying every stitch and every needle I thread. 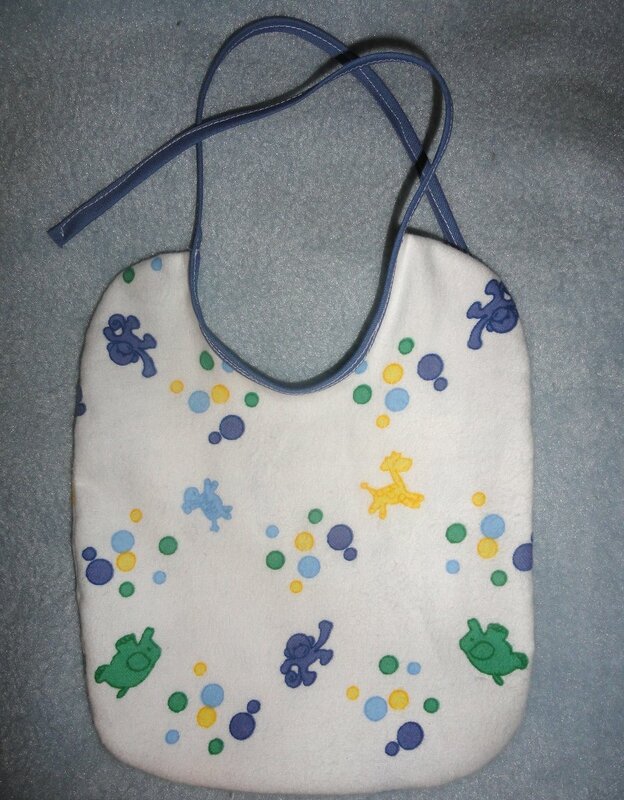 I'm looking for more tutorials or patterns for all the little odds and ends that make this first year of life a bit easier or more comfortable - for the babies and the parents. If you know of anything that you used, or think is really cute, or a must-have, please leave a link so I can see it. I have a large stash of fabric, organic cotton, alpaca and wool yarn and I'm all ready to go. Life is never static. Things change all the time. Just when you think it's looking fine, change breezes in, and the work starts again. 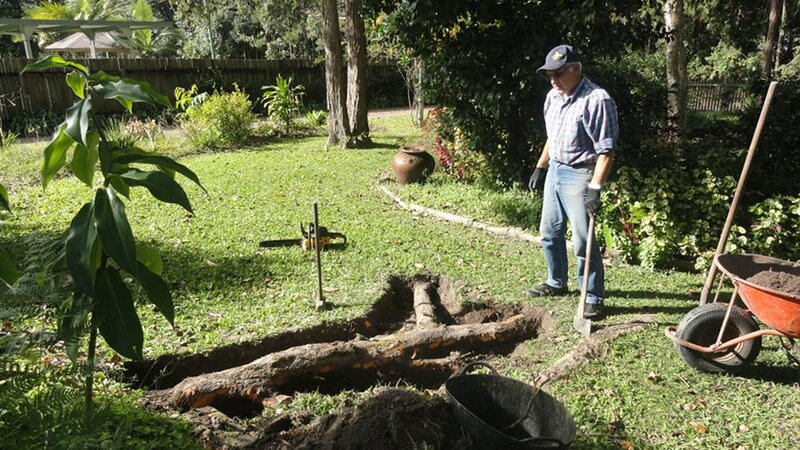 On Saturday, Hanno and I were having breakfast and discussing our vegetable and fruit gardens. 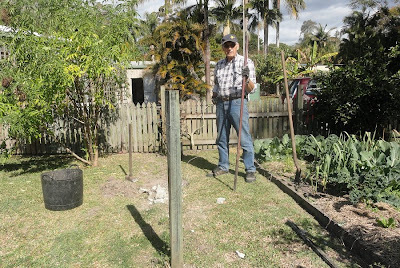 I said I thought it would be a good idea to fence the chooks off from the fruit - that we should look at the fruit area as an orchard, and put in more fruit. 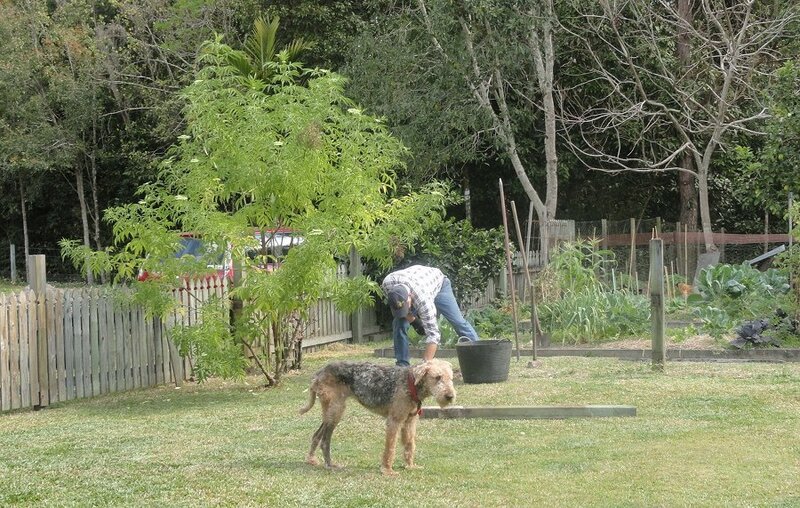 I suggested that we move the picket fence we have at the front of the vegetable garden - the fence we originally put up to keep two mental and energetic young Airedale Terriers out of the vegetable patch, over to fence off the orchard from the rest of the garden. Those two Airedales are now one and she is old, almost blind, totally deaf and certainly doesn't run anywhere. 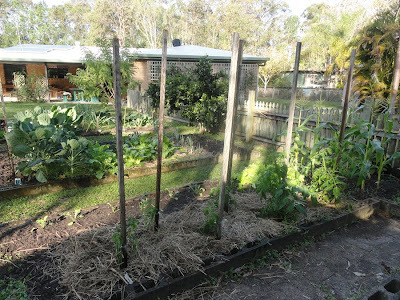 The garden problem now is that the chooks scratch around the roots of the fruit trees because they're covered with mulch. So, the problem has been discussed, we'll work out what we'll do and get around to it fairly soon. The original setup, now 14 years old. Wrong! By the time I was washing up, the picket fence was being taken down and the configuration of the backyard was changing again. 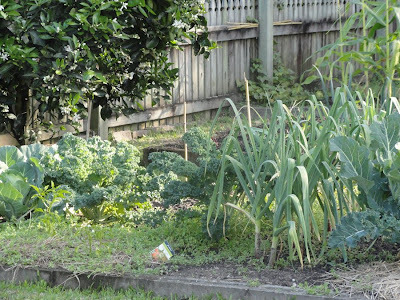 When you first start out on backyard gardening, you often think your designs and ways of working will stay the same forever. That is rarely the case and if you stay at it long enough, what used to work, will stop working and if you want to continue, you have to change what you carefully set up. I love change. I love the new possibilities and opportunities it brings. Our aim now is to have fruit growing all year. The two recent weather events in Australia that shot banana prices up to $12 a kilo shocked us and has made us determined to keep our bananas growing as much as we can through the year. 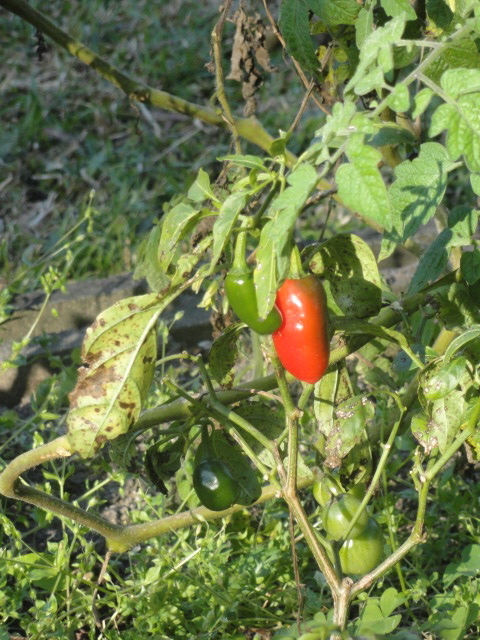 In that orchard area we're also growing loquats, grapes, oranges, pink grapefruit, mandarins, passionfruit and loofahs. All the citrus are loaded with flowers for the next lot of fruit and, amazingly, the loofas are still growing from last year, and they're flowering again. They grew all through winter! 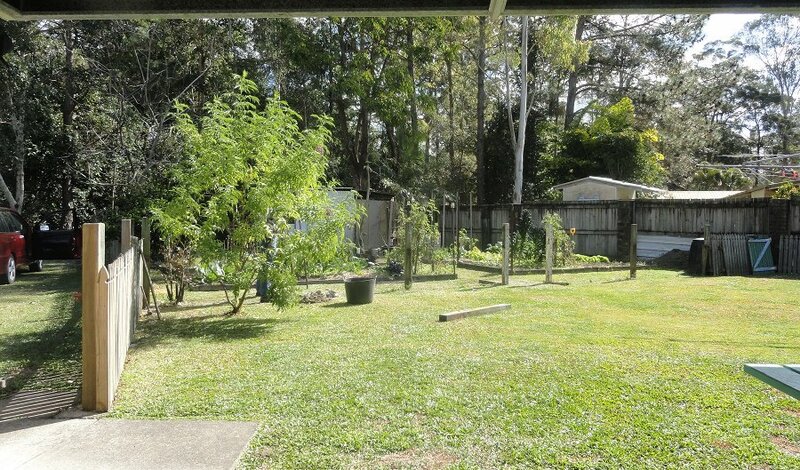 When we get the fence up I plan on planting raspberries along the fence and vanilla orchids in with the loofahs. With the chooks unable to access the fruit trees, we'll be able to look after them properly and keep the fruit going longer. We hope to have different types of fruit growing throughout the year. We've also been thinking carefully about what new vegetables we have to plant so we don't have to rely on buying too much at the market. With the financial crisis dragging on and on, I think it's prudent to think more about the money-saving benefits of vegetables, fruit and hens, and not just the health and lifestyle benefits. It's one of the easy things we can do that will make a difference to what we eat and how much we spend on food. The vegetable garden has always been a priority for us, now we'll give that same emphasis to the fruit we grow and make sure we keep the garden going for as long as we can. Our succession planting will move up a notch and we'll be growing lettuces and herbs in containers this year so they can be moved around as the weather changes. 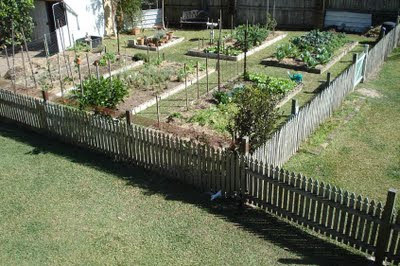 That's the plan - spend a little more on seeds, mulch and fruit trees and expand a little. Wise economy. 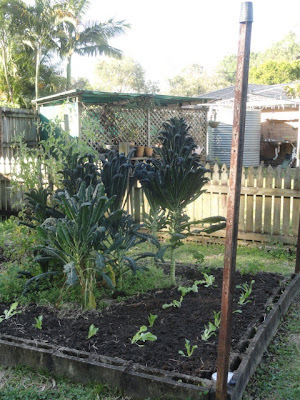 What's happening in your vegie patch? Are you making changes that will see you through the tough times ahead? How has your garden changed since it went in? I'll finish the book reading this morning, then I have in mind that I'll do some sewing for the babies. 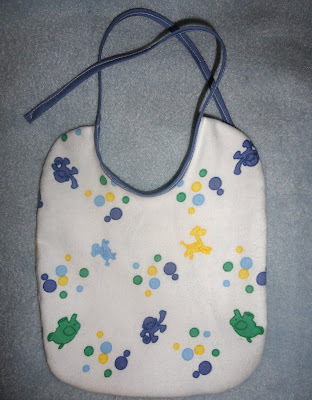 Probably a couple more nappy/diaper soakers - the idea and pattern from The Byron Life, and a few bibs. I'm looking forward to a relaxed weekend full of knitting and sewing. I hope your weekend is as restful as you hope it will be. I just want to take a bit of time to tell you how much I appreciate your support - for me, my blog and the book. Denise asked yesterday if I ever dreamed when I started the blog if I ever thought something as wonderful as a book would happen. Of course the answer to that is no, I didn't have any expectations; I just wanted to write and connect with other women and men who were living as Hanno and I do. There were no thoughts of followers or popularity. And yet here we are - it amazes me when I stop and think about it. So thank you, not only for your good wishes for the book, but for the support and encouragement you've shown over the years that kept me writing. This is just a teaser - an indiction of what you'll find in the book. In a busy week full of reading and workshops, today I am totally focused on finishing the final reading my book before it goes to the printer. I am so happy with what I have here - the book with photos and graphics - fully presented as you will see it when it's published (next March). So please bear with me, I'll be back here with you tomorrow. "I became a single Mum almost 4 years ago I realised that my priority had to be to spend nothing so that I could buy another house to bring my kids up in. And it had to have a yard big enough for fruit trees, veggies etc...I bought probably the worst house in a safe area for the kids. I was soooo lucky to achieve this just as the GFC was picking up pace, especially given that I had given up my work (self-employed) to be home with my kids, and was just re-establishing my business. My question now is, do I keep trying to pay the mortgage down fast and finish renovating (necessary for health and safety), or should some of my money be going towards super? (I have only about $30000 and I'm 44. My thought is, what if I make us as self-sufficient as possible by saving for solar panels, water tanks etc… and of course gardening and making things - am I deluded if I think I will be able to survive on a tiny amout of super if I'm debt-free and self-sufficient? I really don't think much will be available in the way of pensions when I'm 65 and I wonder what you would do in my position? My children are 8 and 11. I do support myself with my business (I'm a pianist and teach too, mostly from home). However, without child support and a bit of family tax benefit I wouldn't be able to support my family - unless I took on a lot more work. I was working every other Saturday to try and get ahead financially, but realised this only made me more exhausted and stressed, my kids didn't want me to do it, and it didn't seem to give me extra income in the long run. This is because I had to let the vegetable garden go, stopped baking bread etc... The good news is, I have no debt other than my mortgage, and a bit of rainy day savings." Well Martha, the short answer is, yes, you are deluded to think you can survive on that amount of money when you retire if there is no pension then. And I think that in 21 years time, when you're 65, the retirement age will be closer to 70. However, you asked what I would do. I think you're doing the right thing, actually. Buying an older home in a good area is what I would have done. The good news is, if you have no debt and live in your own home with opportunities to grow food and have chooks, you won't need nearly as much as they say you need when you retire. I would stop paying superannuation at the moment while you renovate, but in the long term, I think it's wise to continue paying it. Remember, it's not only the lump sum at the end of your working life, there are also tax benefits too. If I were in your shoes, I would to continue to pay off the mortgage as fast as possible, even if some months you can only manage an extra $50. Everything extra is a real bonus. But you also need to renovate. While you're renovating, buy as much as you can from ebay, demolition yards and second hand shops. There are lots of ways you can cut back, even when you're renovating. It's good you have those "rainy day savings" - that can be your emergency fund while you renovate. If you're self employed, you'll probably be doing your own payments into your super fund, these may be regular payments or lump sums. As soon as the renovating is over, build yourself an emergency fund, then start regular contributions to your superannuation again. You still have over 20 years you can pay into your fund, taking a couple of years off to get your renovations done won't make too much difference in the long run. The main focus should be to get the home in order, make sure it's safe and sound, and you and your family are too, then start thinking about your retirement. There is absolutely no doubt in my mind that you and your children will be better off living in a home that you own. If that home is set up to support a frugal and simple life, with vegetable gardens, hens, water tanks and solar panels, you will reap those benefits for many years. But you also need money to pay rates, for the emergencies that will come up over the years, for insurance and for the enjoyment of life. "The Association of Superannuation Funds of Australia, together with Westpac, found that to have a comfortable lifestyle, retired singles who live in their own home need to spend $36,607 a year and couples $48,648." This is from How much do you need to retire? Hanno and I live on less than that, anyone can - it all depends on what you're will to do without and how much work you can do in your home, while remaining happy, optimistic and strong. There can't be a definitive answer to the question about how much money you'll need in retirement, because it depends on how long you'll live and no one can predict that. But if you produce some of your own food, if you have set your home up well to support an environmentally sound life and if you live simply, then you will be in a better position to live well than if you didn't have those supports. Don't forget to learn as much as you can about the things that will support you and live simply now. That will help with your current financial situation and when you do retire, it will be a smooth transition to your new life. This is a really good retirement calculator. You can fiddle around with it and see how much you'd have on retirement using differing super payments. It also gives actions plans and ideas about working longer. There are just two points I'd like to add. 1. Make sure all your superannuations is in ONE account. Fragmented super will cost you money. Usually the industry-specific funds give the best returns so I hope you're in one of those. If you have to transfer fragmented funds to one account, know the cost of your transfer fees before you act. 2. Enjoy life as you go along. That is easily done while living simply but you are the sole breadwinner and that can brings responsibilities and concerns that may keep you from the lighter side of life. Look for ways you and your children can spend time together and have fun without it costing a lot of money. Camping, homemade pizza and movie nights, swimming in summer, hiking in winter - all these things will show your children that enjoyment isn't always bought. It will also give you a break from those sole parent responsibilities and help you see that happiness is still all around you. That is what I would do. Do you have any thoughts for Martha? I haven't written about our garden much lately but it's still here, happily bubbling away in the background, providing much of our fresh food. 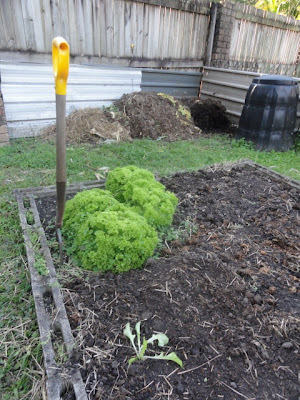 It's getting towards the end of winter here so we'll be planting a few more summer vegies now - increasing the number of potatoes, tomatoes, capsicums (peppers) and cucumbers. We have a wonderful crop of Portuguese cabbage, grown for the first time this year from seeds sent to me by a permaculturalist in Melbourne. It's fast become my favourite cabbage. 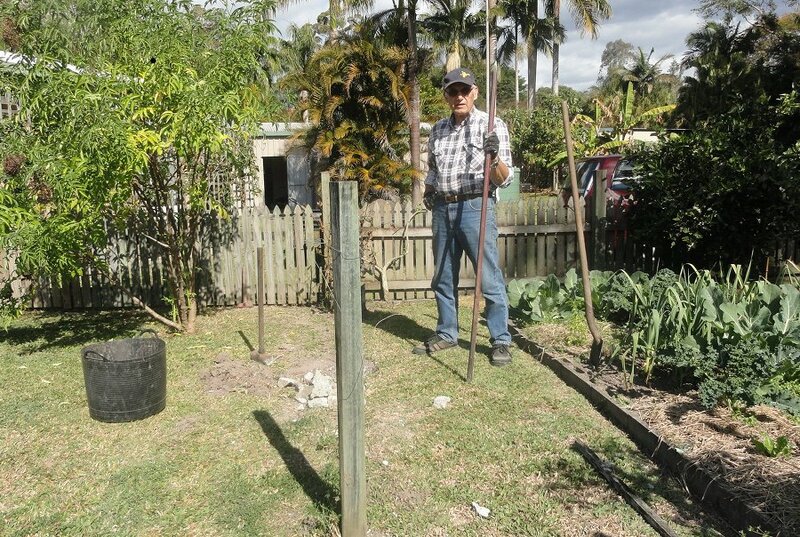 Hanno does a wonderful job in our garden. I love that he feeds the gardens so well between plantings and the quality of the food that comes out of that garden is a real credit to him and the work he puts into it. 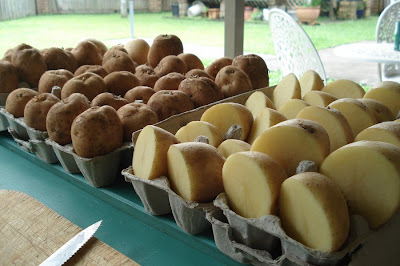 These Pontiac potatoes were dug up last week. The basket is usually filled with what we'll eat that day but I often grab the tomatoes to ripen indoors. No matter what we do in the garden, the chooks are always watching, hoping for a bug to be thrown their way. Two of our chickens died in the past week. They were old girls and we'll miss them. The rest of them - I think we have about six or seven chooks left - are keeping us in eggs, even though a couple of them are too old to lay regularly. Soon we'll start looking around for a few more ladies to join our family. After 30 years keeping chickens in the backyard, I can't imagine living without them now, and it would be impossible to live happily without good eggs. Whatever we give them - a safe home, good food, fresh water and love, they always give back more. The empty spaces don't stay empty for long. To successfully plant for the table, you need to have seeds on the go most of the time, know how long they take to grow to maturity and keep on top of the bug population. 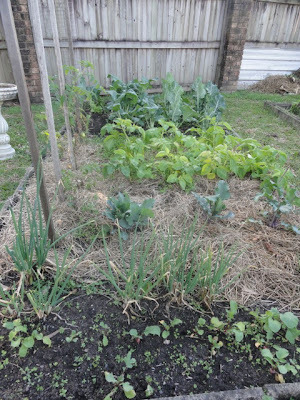 This garden has been weeded, raked over and had manure added. It's ready for planting. 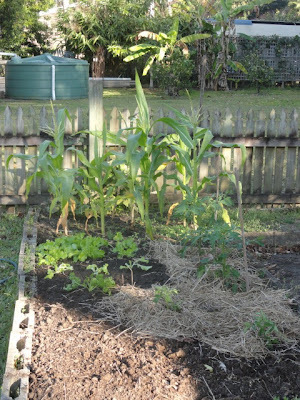 Corn, Colossal tomatoes and lettuce. 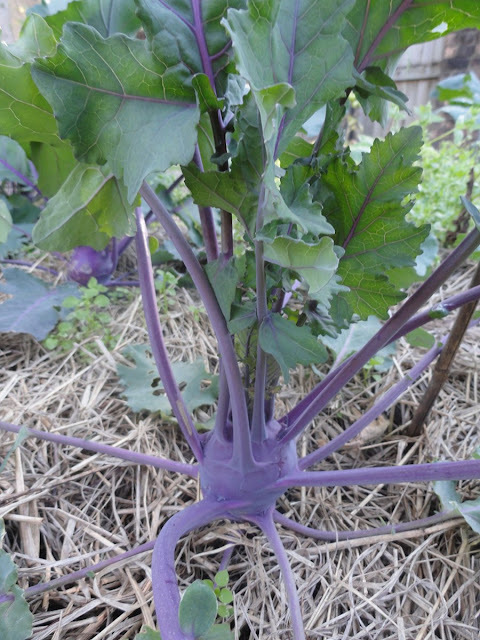 Radishes, Welsh onions, kohl rabi, potatoes, Portuguese cabbage, tomatoes and silverbeet (chard). 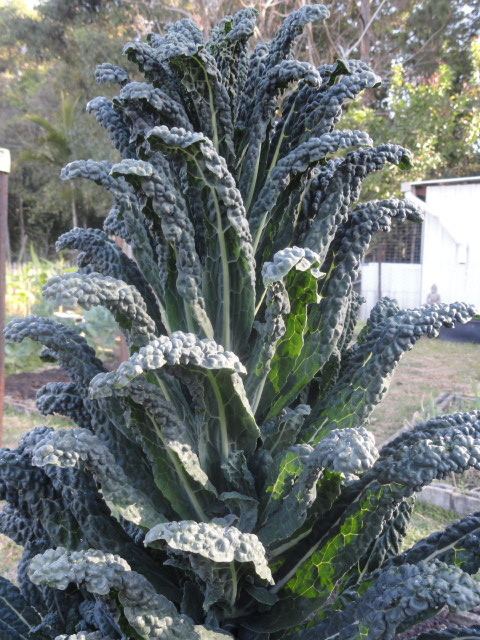 The black kale plants (Cavolo nero) have grown really tall this year and as they've been harvested from below, they're started to look like palm trees. The last of the turnips. Bok choy, Daikon radishes and brussel sprouts. It's always peaceful out there wandering down the green pathways between garden beds. Gardening, particularly vegetable and fruit gardening for the home is such a satisfying way to spend time. Plunging my hands into fertile soil connects me back to the natural world in a way nothing else can. We're lucky to have such a wonderful climate here and can produce food year round. It can be hard work, but as we get such wonderful harvests, we wouldn't have it any other way. New lettuce beside lettuce waiting to be harvested. Such is the look of a productive garden. Speaking of gardens, I received a gift from my editor at Penguin - Kitchen Gardens of Australia by Kate Herd gives a wonderful account of 18 local kitchen gardens, complete with garden plans, photos and the stories of the gardens and the people who work in them. It's interesting and inspiring and I can't wait to dive right into it. There are a number of people we Australians recognise - Jeremy Colby Williams' wonderful garden at his home, Bellis; the beautiful Gay Bilson's country kitchen garden as well as a self-sufficient garden on an historic Tasmania farm and a locavores' garden in the Red Centre, and much much more. I'd been taking peaks into this book whenever I visited my local book shop, and I'm so pleased I now have a copy that I can relax with and read from cover to cover.